After modernization, part of a total of 365 vehicles were used by the German Army, but only on secondary fronts. While classified as a heavy tank, its maneuverability rivals that of medium tanks in its own tier, but finds itself hampered by a low top speed. Its armor is more than enough for its tier. Its fast reloading gun has little problem destroying most tanks in its tier, but will struggle when facing better armored foes. Fortunately, in World Of Tanks Blitz the Pz. B2 has preferential matchmaking and does not see tier 5 tanks. The Pz. B2 has been in the premium store several times. Only sees tier 4 battles. The low penetration of the standard rounds means you will use premium rounds often, if not always. But as long as you hit and penetrate, you will still make a low profit, at least with a premium account. Don’t shoot Matildas at long ranges, or Hetzers from the front, as you will mostly bounce. Both are a big threat to you, as they can penetrate you. Also the M3 Lee and the T-28 will penetrate you, but so can you. All tank destroyers can pen you. A good way to avoid damage is to angle 45°, and drive forward and backwards. That makes aiming for your turret and frontal weakspot very hard, but your very short aim time and the small aiming circle allows you to constantly hit the enemy. Again a reminder: Since the B2 has special matchmaking, you may only platoon with other B2s or Valentine II. All other tier 4s may bring you at least into tier 5 battles. The Char B1 was a French heavy tank manufactured before World War II. The Char B1 was a specialized heavy break-through vehicle, originally conceived as a self-propelled gun with a 75 mm howitzer in the hull. Later, a 47 mm gun in a turret was added, allowing it to function also as a Char de Bataille, a "battle tank" fighting enemy armor, equipping the armored divisions of the Infantry Arm. Starting in the early twenties, its development and production were repeatedly delayed, resulting in a vehicle that was both technologically complex and expensive, and already obsolete when real mass-production started, in the late thirties, of a derived version: the Char B1 "bis". Of a second up-armored version, the Char B1 "ter", only two prototypes were built. Among the most powerfully-armed and armored tanks of its day, the type was very effective in direct confrontations with German armor in 1940 during the Battle of France, but a slow speed and high fuel consumption made it ill-adapted to the war of movement then fought. After the defeat of France, captured Char B1 (bis)s would be used by Germany, some rebuilt as flamethrowers or mechanised artillery. 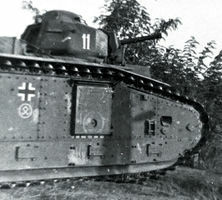 The Char B1 had its origins in the concept of a Char de Bataille conceived by General Jean-Baptiste Eugène Estienne in 1919, in his memorandum "Mémoire sur les missions des chars blindés en campagne". It had to be a "Battle Tank" that would be able to accomplish a breakthrough of the enemy line by destroying fortifications, gun emplacements, and opposing tanks. In January 1921, a commission headed by General Edmond Buat initiated a project for such a vehicle. To limit costs, it had to be built like a self-propelled gun, with the main weapon in the hull. To minimise the vehicle size, this gun should only be able to move up or down, the horizontal aiming to be provided by turning the entire vehicle. The specifications included: a maximum weight of thirteen metric tons, a maximum armor of 25 millimeters, a hull as low as possible to enable the gun to fire into vision slits of bunkers, a small machine gun turret to beat off enemy infantry attacks, and at the same time, serving as an observation post for the commander and a crew of (at most) three men. Two versions should be built; one a close support tank armed with a 75 mm howitzer, the other an anti-tank vehicle with a 47 mm gun instead. The French industry was very interested in the project. In the past, this had often led to much non-constructive rivalry. Estienne, who in the war had personally witnessed the dismal effects of such a situation, was determined to avoid a repetition this time. He used his position as Inspector-General of Tanks to enforce the so-called "Estienne accord" on the industrialists, ordering them to "reach a mutual understanding, free from any spirit of industrial competition". To to be allowed to join, they had to agree beforehand to relinquish any patents to the Army, which would be free to combine all projects into a single type. In exchange, industry were promised very large orders of no less than a thousand vehicles. On these conditions, four projects were started in 1921: two by a cooperation between Renault and Schneider (the SRA and the SRB), one by FAMH (Forges et Aciéries de la Marine et d'Homécourt, better known as Saint Chamond), and the last by FCM (Forges et Chantiers de la Méditerranée), the FCM 21. Renault and Schneider would each get to produce 250 units, FAMH and FCM each 125. A fifth producer, Delaunay-Belleville, of which the project (an improved FT 17) had been rejected beforehand, would be allowed to make 83 tanks; the remaining 167 would be allotted at the discretion of the French State. On 13 May 1924 the four prototypes were presented at the Atelier de Rueil, where they were compared, each having to drive over a twenty kilometer test course. Immediately, it became evident that their technical development had been insufficient, most breaking down: the SRA vehicle even started to fall apart. Maintenance was difficult because the engines were inaccessible. All projects used a three-man crew, but differed considerably in size, form, and the solution chosen to laterally point the gun. The SRA was the heaviest vehicle at 19.5 metric tons. Its length was 595 centimeters, its height 226 cm, and its width 249 cm. It had a 75 mm howitzer in the right side of the hull and a cast, 30 mm thick, turret with two machine-guns. It was steered by an epicyclical transmission combined with hydraulically-reinforced brake disks: during tests, this failed to provide the desired precision. Seen from the front, it already was very similar to the final model, but its side view was more like that of the British Medium Mark D, including the snake-track system, with the drive wheel higher than the idler in front. The suspension used leaf springs. A Renault six-cylinder 180 hp engine (a bisected 12V aircraft engine) allowed for a maximum speed of 17.5 km/h, and a four hundred liter fuel tank gave a range of 140 kilometers. The SRB was a somewhat larger vehicle, six meters long, 228 centimeters high and 2.5 meters wide. It was nevertheless lighter at 18.5 tons, a result of having a smaller 47 mm gun: it, thus, was the antitank-version. Using the same engine, its speed was accordingly slightly higher at 18 km/h. More limited fuel reservoirs, holding 370 liters, decreased the range to 170 kilometers. It used an advanced hydraulic suspension system and the hydraulic Naeder-transmission from the Chaize company combined with a Fieux clutch and Schneider gear box. It used modified FT 17 tracks. The upper track run was much higher, creating enough room for a side door on the left. 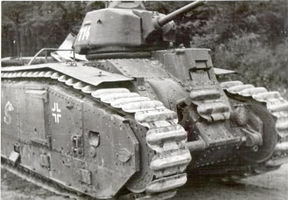 The FAHM prototype resembled the contemporary Vickers Medium Tank. It weighed seventeen tons, was 520 centimeters long, 240 cm high, and 243 cm wide. It used a hydro-pneumatic suspension. Despite a weaker Panhard engine of 120 hp, it still attained a speed of 18.2 km/h. Fuel reservoirs of just 230 litres limited its range to a mere seventy kilometers. The 75 mm howitzer was placed in the middle of the hull and steered by providing each snake-track with its own hydraulic Jeanny transmission. On top was a riveted machine-gun turret with 25 mm armor. The lightest prototype was the FCM 21 at 15.64 tons. 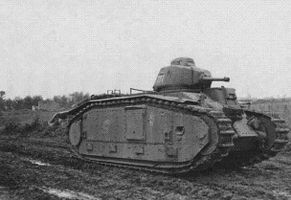 It resembled a scaled-down Char 2C, the giant tank produced by the same company. It was very elongated with a length of 6.5 meters and width of 205 centimeters. A rather large riveted turret with a stroboscopic cupola, adopted from the Char 2C, brought its height to 252 centimeters. Like the superheavy tank, it had no real spring system for the twelve small wheels per side. Separate clutches for each snake-track allowed it to horizontally point the 75 mm howitzer in the middle of the hull. It used the same Panhard engine as the FAHM type and its speed was the lowest of all at 17.4 km/h. However, five hundred-liter reservoirs allowed for the best range at 175 kilometers. In March 1925, Estienne decided to base the future production type on the SRB, as regarding general form and mechanical parts. However, it would be fitted with the 75 mm gun, a Holt-track to be developed by FCM (this company had completed a special research program aimed at optimising weight distribution), and the FAMH-suspension (later, this would again be discarded). Estienne also had some special requests; a track tension wheel should be fitted, adjustable from the inside, and a small gangway from the fighting room to improve the accessibility of the engine compartment. Furthermore, the front armor should be increased to 40 millimeters. In November 1925, Renault was given the order to build a wooden mock-up, and that was finished early 1926. On 27 January 1926, it was decided to build three prototypes of what was provisionally called a Tracteur 30, a final design by engineer Alleaume of the Schneider company, cooperating with the STCC (Section Technique des Chars de Combat). The first was to be delivered by Renault, the other two by FCM and FAHM, respectively. That same year, the Direction de l'Infanterie, in the "Plan 1926", redefined the concept of a Char de Bataille. There would be a greater emphasis on infantry support, implying that the anti-tank capacity was secondary and no armor increase was necessary. The weight was to be limited to 22 metric tons, and the speed might be as low as 15 km/h. However, as a radio set would have to be fitted to better direct and coordinate its actions, a fourth crew-member was needed. On 18 March 1927, the contracts for the three prototypes were signed. The hull of the first Renault vehicle, made of softer boiler plate instead of armor steel to simplify changes, was finished in January 1929, apart from the armament. It was delivered in March. The separately-produced cast turret was delivered on 23 April. The howitzer could only be fitted in April 1930. This prototype was allotted the series number N° 101. N° 102, the production of which FAMH had shifted to Renault, was delivered soon after. In September 1930, FCM delivered N° 103, constructed by Atelier de Mépanti at Marseille. One of the vehicles was fitted with an alternative 75 mm Schneider gun, instead of the 75 mm St Chamond M 21 from FAMH. Testing on the first prototype had already begun before the other two were delivered, or even its main armament fitted. It had, with 24,750 kilograms, a weight higher than specified, but could nevertheless reach a top speed of 24 km/h. From 6 May until August 1930, the Commission d'Experiences des Matériels de Chars carried out a further test program on what was now officially called the Char B: the "B" not referring to Bataille, but to a general classification code. The commission was largely satisfied with the vehicle, though many smaller problems were detected that had to be improved. The FCM prototype featured several alternative technologies; a Winterthur transmission, a Citroën clutch, and a Sulzer diesel engine, later replaced by a Clerget diesel. All of these systems would prove to be more unreliable than the original concept and were ultimately rejected. The three vehicles were not only used for technological, but also tactical, experiments. Together with the Char D1 pre-series, they represented the only modern tanks in France and the Army was naturally very interested in what lessons could be learned from them about future warfare, outlining the concept of a Char de Manoeuvre. Neither Char de Bataille nor Char de Manoeuvre are official type designations, they refer to the tactical concepts only. In October 1931, a small unit was formed, the Détachement d' Experimentation, in which the prototypes were combined from December, using Camp de Châlons as a base to see how they could be used in winter conditions. Afterwards, on their own power, they drove to the Atelier de Rueil for repairs. In September, they participated in the Champagne summer maneuvers as a Détachement Mécanique de Combat; from 4 May 1933, N° 102 and 103 (together) formed a Détachement d'Engins Blindés to perform tactical experiments in the army bases of Coëtquidan and Mourmelon as part of a motorized light division, followed by comparable experiments in April 1934 at Sissonne. Technical aspects were not forgotten during these tests, and it was established they could attain an average road speed of 19 km/h, cross a trench 2.4 meters wide, and wade through a 105 centimeters-deep stream. The prototypes were again extensively altered to meet changes in specifications. On 6 April 1934, the first order was made for seven Char B1 tanks. The "B1" refers to the fact that there were other simultaneous projects to develop improved types; the Char B2, B3, and B B. 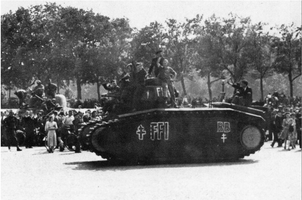 The Char B1 was manufactured by several firms; Renault (182), AMX (47), FCM (72), FAMH (70), and Schneider (32). Although it was the main producer, Renault had not exclusively designed the tank. Therefore, the official name was not thr Renault B1 as is often erroneously given. It was a very-expensive tank to build: the per-unit cost was about 1.5 million French francs. In France at the time, two schools of thought collided; the first wanted to build very-strong heavy tanks, the other a lot of cheap light tanks. Both sides managed to influence procurement policy to the end that not enough tanks were built of either category, to the exasperation of men like Colonel Charles de Gaulle who wanted to build more of the medium Char D2, at a third of the cost of the Char B1 bis, but armed with the same 47 mm gun. The outer appearance of the Char B1 reflected the fact that development started in the twenties: like the very first tank, the British Mark I tank of World War I fame, it still had large tracks going around the entire hull and large armor plates protecting the suspension. Like all tanks of that decade, it had no welded or cast hull-armor. The similarity resulted partly from the fact that the Char B1 was a specialised offensive weapon, a break-through tank optimised for punching a hole into strong defensive entrenchments, so it was designed with good trench-crossing capabilities. The French Army thought that dislodging the enemy from a key front sector would decide a campaign, and it prided itself on being the only army in the world having a sufficient number of adequately-protected heavy tanks. The exploitation phase of a battle was seen as secondary and best carried out by controlled and methodical movement to ensure superiority in numbers. So, for the heavy tank, mobility was of secondary concern. Although the Char B1 had, for the time of its conception, a good speed, no serious efforts were made to improve it when much-faster tanks appeared. More important than the tank's limitations in tactical mobility, though, were its limitations in strategic mobility. The low practical range implied the need to refuel very often, limiting its operational capabilities. This again implied that the armored divisions of the Infantry, the Divisions Cuirassées de Réserve, were, despite their name (that merely reflected the fact that they had originally been planned to be raised in a secondary mobilisation) not very effective as a mobile reserve and thus, lacked strategic flexibility. They were not created to fulfill such a role in the first place, as was shown by their small organic artillery and infantry components. Another explanation of the similarity to the British Mark I lies in the Char B1's original specification to create a self-propelled gun able to destroy enemy infantry and artillery. The main weapon of the tank was its 75 mm howitzer, and the entire design of the vehicle was directed to making this gun as effective as possible. In the early 1930s, when it became obvious that the Char B1 also had to defeat counter-attacking enemy armor, it was too late for a complete redesign. The solution was to add the standard cast APX-1 turret, which also equipped the Char D2. Like most French tanks of the period (the exception being the AMC 34 and AMC 35), the Char B had a small one-man turret. Today, this is typically seen as one of their greatest flaws. The commander, alone in the turret, not only had to command the tank, but also aim and load the gun. If he was a unit leader, he had to command his other tanks as well. This is in contrast with the contemporary German, British, and Soviet policy to use two or three-man turret crews, in which these duties were divided amongst several men. The other nations felt that the commander would otherwise be over-tasked and unable to perform any of his roles nearly as well as the commanders of tanks with two or three-man turret crews. Whether this left the Char B1 less-formidable in actual combat than a review of its impressive statistics suggests is difficult to ascertain. In 1940, the vast majority of Char B1 combat losses were inflicted by German artillery and anti-tank guns. 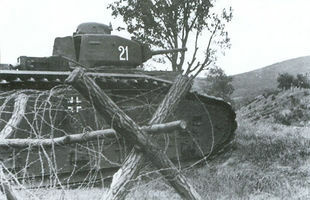 In direct meetings with German tanks, the Char B1 usually had the better of it, sometimes spectacularly so: as when on 16 May, a single tank, Eure, frontally attacked and destroyed thirteen German tanks lying in ambush in Stonne, all of them Panzer IIIs and Panzer IVs, in the course of a few minutes. The tank safely returned despite being hit 140 times. Similarly, in his book Panzer Leader, Heinz Guderian related an incident, which took place during a tank battle south of Juniville: "While the tank battle was in progress, I attempted, in vain, to destroy a Char B with a captured 47-mm anti-tank gun. All the shells I fired at it simply bounced harmlessly off its thick armor. Our 37-mm and 20-mm guns were equally ineffective against this adversary. As a result, we inevitably and sadly suffered heavy casualties". The question becomes even more complicated when we consider that the Char B1 was not a very typical French tank, as it had two guns and a radio. An additional draw-back of French turret design was that their cast turrets had no hatch in the top, forcing the commander to fight 'buttoned-up', resulting in a poor situational awareness. The reason the French favored small turrets, despite their shortcomings, was that they allowed for much smaller, and thus cheaper, vehicles. Although the French expenditure on tanks was relatively larger than the German's, France simply lacked the production capacity to build a sufficient number of even heavier tanks. The Char B1 was expensive enough as it was, eating up half of the infantry tank budget. The one man-turret can thus be seen as reflecting French design and production constraints. The original Char B1 had frontal and side armor up to 40 mm thick. The vehicle had a fully traversing APX1 turret with a 47 mm L/27.6 SA 34 gun. This had a poor anti-tank capability: the thirty APHE (Armour Piercing High Explosive) rounds among the fifty the tank carried had a maximum penetration of about 25 mm. In addition, it was armed with a 75 mm ABS 1929 SA 35 gun mounted in the right-hand side of the hull front, and two 7.5 mm Châtellerault M 1931 machine guns: one in the hull and the other in the turret. The 75 mm L/17.1 gun, that could fire both a HE and the APHE Obus de rupture Modèle 1910M round, had a limited traverse of only one degree to the left or the right (equating to about 18 metres at 500 m range). It was laid onto target by the driver (provided with the gun sight) through the Naeder hydraulic precision transmission. The traverse had only been made possible in order to precisely align the gun barrel with the sight beforehand. The 75 mm gun had its own loader; the remaining two crew members were the radio operator and the commander, who had to load, aim, and fire the 47 mm gun while commanding the vehicle (and in the case of platoon leaders, command other vehicles as well). The fighting compartment had the radio set on the left and an exit hatch in the right side. All vehicles had the ER53 radio telegraphy set, which used Morse Code only. A hatch in the rear bulkhead gave access to a corridor (under which nineteen 75 mm rounds out of a total of eighty were stowed) in the engine room to the right of the engine, which was officially rated at 250 hp (190 kW), but had an actual output of 272 hp (203 kW). Each tank had its own team of three mechanics. In battle, some of these might join the regular crew. The suspension was very complex, with sixteen road wheels per side. There were three large central bogies, sprung by a vertical coil spring. Each central bogie carried two smaller ones. The three vertical springs moved through holes in a horizontal beam to both extreme ends, of which road wheels were attached by means of leaf springs; three at the front and one at the back. The high track-run gave the tank an old fashioned look, reflecting its long development time. It had a maximum speed of 28 km/h and a weight of 28 metric tons. The range was about 200 km. A total of 34 vehicles were built from December 1935 until July 1937. They had series numbers 102 to 135. Chassis number 101 was kept apart to build the Char B1 ter prototype. The Char B1 bis was an upgraded variant with thicker armor at 60 mm maximum (55 mm at the sides) and an APX4 turret with a longer-barrelled (L/32) 47 mm SA 35 gun, giving the tank a real anti-tank capacity. It was the main production type. From 8 April 1937 until June 1940, 369 units were delivered out of a total order for 1144, with series numbers 201 to 569. Before the war, manufacturing was slow: only 129 had been delivered by 1 September 1939. The monthly delivery was still not more than fifteen in December, and it peaked in March 1940, with 45. The Char B1 bis had a top speed of 25 km/h, provided by a 307 bhp (229 kW) petrol engine. The first batch of 35 Char B1 bis' still had the original engine: from 1938 to May 1940 they were slowly re-equipped. Its weight was about 31.5 metric tons. The operational range was about 180 km: not much different from other tanks of the period. But if the tank wanted to travel at a decent, but for its engine, inefficient road-speed of 20 km/h, it would deplete its three fuel tanks with a total capacity of 400 liters within six hours. At first, trailers were towed with an 800 litre auxiliary fuel tank, but this practice was soon abandoned. Char B1 units, therefore, had a large organic component of fuel trucks and TRC Lorraine 37 L armored tracked refuelling vehicles specially designed to quickly refuel this particular tank type. The last tanks to be produced in June had an extra internal 170 litre fuel tank. To cool the more powerful engine, the Char B1 bis had the air intake on the left side enlarged. It is often claimed this formed a weak spot in the armor, based on a single incident on 16 May near Stonne, where two German 37 mm PAK guns claimed to have knocked out three Char B1s by firing at the intakes at close range. Theoretically, the air intake, which was a 6-inch (150 mm) thick assemblage through which horizontal slits first angled upward and then downward between 28 mm thick armor plates, should not be more vulnerable than the normal 55 mm side plates. During the production run, the type was slowly improved. Tank numbers 306 to 340 carried 62 47-mm rounds (and the old complement of 4,800 machine gun rounds): later tanks 72 and 5,250. However, the B1 bis had fewer 75 mm rounds compared to the B1 proper; 74 instead of eighty, of which normally only seven were APHE ammunition. Early in 1940, another change was made when the ER53 was replaced by the ER51, which allowed spoken wireless communication. The company and battalion command tanks also had an ER55 to contact their superiors. The crews of the 1re DCR kept their old sets however, preferring them because the human voice was drowned by engine noise. The Char B1 ter, with sloped and welded 70 mm armor, a weight of 36.6 metric tons, and an engine of 350 hp (260 kW), was meant to replace the B1 bis to accelerate mass production from the summer of 1940. Cost was reduced by omitting the complex Neader transmission and giving the hull gun a traverse of ten degrees instead. Only two prototypes could be finished before the defeat of France. In May 1940, it was agreed to deliver nine Char B1's each month to Britain in exchange for a monthly British production of the "H 39". The Char B1 served with the armored divisions of the Infantry, the Divisions Cuirassées de Réserve. These were highly-specialized offensive units, optimised to break through fortified enemy positions. 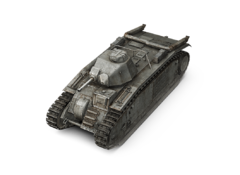 The mobile phase of a battle was to be carried out by the armored divisions of the Cavalry, equipped with the SOMUA S35. The First and Second DCR had 69 Char B1s each, the Third 68. The 37th Bataillon de Chars de Combat, serving with 1DCR, was at first equipped with the original B1, but these vehicles were refitted with the longer SA 35 gun in the spring of 1940. The turret type designation was changed to APX1A. The battalion was re-equipped with the Char B1 bis and in May, reinforced by five of the original tanks. After the German invasion, several ad hoc units were formed; the 4DCR with 52 Char B1's and five autonomous companies (347e, 348e, 349e, 352e and 353e Compagnie Autonome de Chars) with a total 56 tanks, 12 B1's and 44 B1 bis. Also, 28BCC was reconstituted with 34 tanks. The regular divisions destroyed quite a few German tanks, but lacked enough organic infantry and artillery to function as an effective mobile reserve. A number of Char B1's (161) were captured by the Germans during the Fall of France. These were later pressed into service as second-line and training vehicles under the name of Panzerkampfwagen B-2 740 (f). Sixty became platforms for flamethrowers as Flammwagen auf Panzerkampfwagen B-2 (f). Sixteen were converted into 105 mm self-propelled artillery. Ordinary tank versions were also frequently modified. For example, additional armor was placed above the main gun, and a winch mechanism was added behind the turret. One unit, Panzer-Abteilung 213, was equipped with the Char B1 bis and deployed on the Channel Islands from 1941 to 1945. One of their tanks is displayed by the Bovington Tank Museum, though repainted in French colors. The last surviving Char B1 can be seen at the "Association pour la Sauvegarde du Patrimoine Historique et Militaire" (ASPHM), near Strasbourg, in France. It was previously at the Fort de Seclin. It is in poor condition, with parts like the main gun missing. It was salvaged from a firing range, but will be restored by the owner. 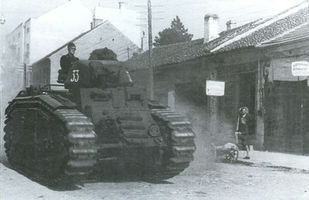 Ten Char B1 bis can be seen in various places in Great Britain and in France. Three are in the Musée des Blindés in Saumur, France. One, at Flandres, is in running condition, another, at Rhône, is in permanent display in the museum. A third, a mine roller tank, is in storage. Three are owned by the ASPHM, which bought one of them at the same time as the B1, from the Fort de Seclin. This B1 bis is also in poor condition, with parts, including the main gun, missing. Salvaged from a firing range, it is intended for restoration by the owner. The two others were acquired in 2009 and are very-badly damaged. They will most likely be used as "organ donors" in order to restore the B1 and one of the B1 bis. One of the two B1 bis wrecks was identified as being n° 243 Intrépide, which belonged to the 8th BCC and was put out of combat on 1 June 1940, at Moreuil. Two are on display at the 501st-503rd Tank Regiment at Mourmelon-le-Grand, France. One of these tanks was previously on display at the ERGMEB, Gien. This page was last modified on 10 October 2017, at 11:06.